If you’re a spicy sort who loves a bit of Caribbean cuisine, then Turtle Bay in Leeds should be the next thing to treat your tastebuds to. Situated in The Light on The Headrow, my friend and I wandered in one Friday afternoon to check out the menu, and see if the cocktails they’re renowned for really do live up to expectation. Oliver welcomed us in to Turtle Bay, and showed us to a table in the window. A great view of the Leeds world walking by. But the view inside Turtle Bay is nice on the eye too. A mixture of beach bar and shanty town, awash with a carnival of Caribbean colour. As we were handed a menu, we ordered a couple of cocktails. Island Iced Tea for me, Strawberry Daiquiri for my friend. Pleasingly, it’s happy hour – which means we get two cocktails for the price of one. We didn’t realise this, so we were already on to a winner! It’s a good sized menu at Turtle Bay. It offers sharing plates, goat burgers, Callaloo, Vegan options and more. And there’s a good number of eats that took my fancy. Oliver came back to take our order, and I went for the Crispy Squid to start. The Pork Belly won my vote for my main course. My friend plumped for the Jerk Ribs, and the Jerk Sirloin Steak. For a Friday lunchtime, Turtle Bay wasn’t full, but there were a good few groups of people in. It was a chilled out, laid back feel and we liked that. And we liked the starters when they arrived too. 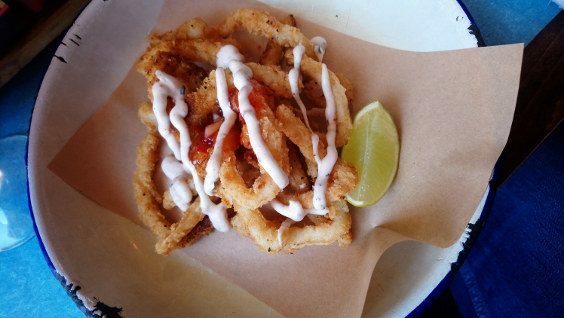 The Crispy Squid (£5.80) came coated in panko, with mango mole and jerk mayo. It was cooked perfectly, and the mayo certainly gave the dish a nice kick. My friend’s Jerk Ribs (£5.50) looked a good choice too, marinated for 24 hours with a spicy jerk glaze and sour orange chutney. We were both impressed and so far the food, the drink and the service had been great. Our cocktails were full strength too. I always get that impression that 2-4-1 cocktails aren’t quite the full ‘shebang’. No worries about that at Turtle Bay though. When our main courses were brought over they looked really good. With bits of colour here and there, presentation is tidy and simplistic, but if Caribbean food is all it’s cracked up to be, who cares? Not me. Not after the first mouthful of my Pork Belly. For £12.50 the dish is Spicy jerk, coconut rice ‘n’ peas, chilli pineapple salad seasoning. The taste sensation that this dish gives you is something else. Soft and succulent meat, and a wave of spice that stays in the mouth. It’s great. It’s tasty. And it’s a choice I was pleased with, with a freshness I liked. Across the table, the prime cut aged sirloin steak (£17.90), in spicy jerk, coconut callaloo and spiced fries was served medium. As per my friend’s request. I tried a piece, and I have to say that although I don’t usually like my steak medium, the flavours it came with meant that didn’t matter. We also went for a bowl of Dirty Curry Fries (£2.90) to share, and they went well as a side. To bring our meal to an end, we both went for the alcoholic desert of the Espresso Martini. But we chose the version made with spiced rum rather than vodka. Given the surroundings, it seemed appropriate. And wow…my third perfect cocktail of the day, and a great way to round off a great meal. I couldn’t fault anything at Turtle Bay, and I see why people rave about the place. The food, the drink, the service and the window seat gave my friend and I a really good start to the weekend.